A parliamentary report of 1777 recorded local workhouses in operation at Tanfield (for up to 30 inmates) and Kyo (20 inmates). ...contains about 2,000 inhabitants, mostly coal miners. Wages of labourers in husbandry are from 1s. 4d. to 1s. 6d. a day, and of coal miners, 2s. to 3s. Farms are small. Potatoes are much grown, which now form the chief diet of labourers' families. The cheapness of fuel seems the cause why this very useful vegetable is more used in the north than in the south of England. Here, as in other coal countries, the surface of the earth is neglected for the inside. It may be doubted, however, if the mines about Tanfield have of late been profitable. The rents of collieries have decreased and many have been shut up. Two paper factories employ about 10 men each. Number of ale-houses, 16. 130 houses pay tax, 270 exempt. There are about 20 Poor in the Workhouse. Other distressed families, which are very numerous, are relieved at home. Table of diet : Breakfast, every day—Hasty pudding, with milk or beer ; Dinner—Sunday, Wednesday—Butcher's meat, with pease pudding or other vegetables ; Monday, Thursday—Pease soup and bread ; Tuesday, Saturday—Boiled barley and milk ; Friday—Suet pudding and dumplins. Supper—Sunday, Wednesday, Saturday—Broth and bread ; Monday, Thursday—Milk, boiled with oatmeal ; Tuesday, Friday—milk and bread. County Durham: Benefieldside, Billingside, Collierly Pontop, Conside and Knitsley, Cornsay, Esk, Ebchester, Greencroft, Healeyfield, Hedleyhope, Iveston, Kyo Laws, Lanchester (2), Langley, Medomsley, Muggleswick, Satley, Tanfield (3). Later Additions: Craghead (from 1896), Knitsley (from 1894), South Moor (from 1894), Oxhill (1894-1916), Stanley (from 1894). The population falling within the Union at the 1831 census had been 7,924 with townships ranging in size from Billingside (population 18) to Tanfield (2,478) and Lanchester itself (1,210). The average annual poor-rate expenditure for the period 1834-36 had been £3,077 or 7s.9d. per head of the population. 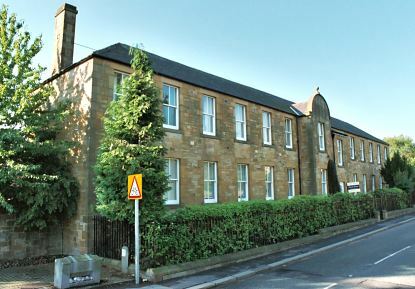 A new Lanchester Union workhouse was built on Newbiggin Road in Lanchester in the late 1830s. The workhouse location and layout are shown on the 1895 map below. At the north of the site, the front range of the workhouse probably contained the original offices and Guardians' board-room. 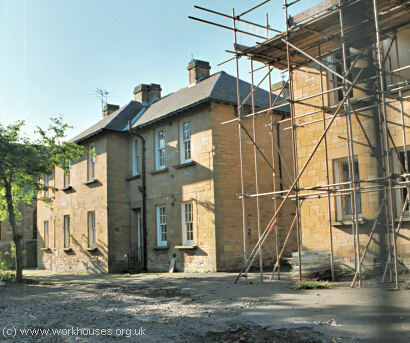 Lanchester workhouse front range from the north-east, 2001. There was an irregular block to its rear, and at the south stood an H-shaped building which may have been the original infirmary. The buildings at the east probably contained casual wards for vagrants and receiving wards for new inmates. In 1894, the British Medical Journal set up a "commission" to investigate conditions in provincial workhouses and their infirmaries. Following a visit to Lanchester, the commission's report was broadly complimentary about conditions in the institution. Its recommendations included the employment of a trained night-nurse and the provision of extra accommodation for offensive and isolation cases. The toilets were of the earth closet type but generally appeared to lack the necessary supply of earth needed to deodorise their contents. Further details are available in the full report. The site developed to the east between 1880 and 1910 with additions including a hospital, union offices, and cottage homes for children, all of which appear on the 1915 map below. Lanchester Union offices from the north-east, 2001. Most of the buildings have now been demolished and replaced by modern housing. Surviving structures include the workhouse entrance range (now used as housing) and the union offices (now the local library). After 1930, the establishment was renamed Lanchester Public Assistance Institution, then in about 1939 became Lee Hill Hospital until its closure and demolition in 1980. 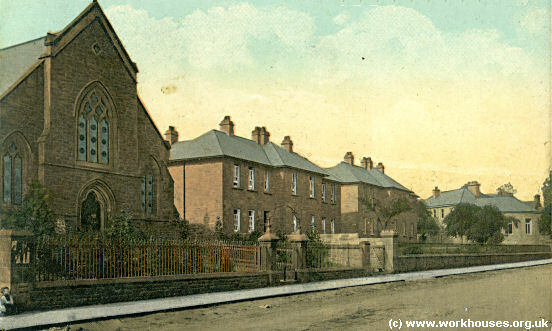 In 1904-5, children's cottage homes were erected at the north-east of the workhouse facing onto Front Road. The Builder reported their opening in March 1905. LANCHESTER. - The new cottage homes for children which the Lanchester Board of Guardians have erected on a site adjacent to their workhouse, and facing the main street in the village of Lanchester, were opened on Friday. The new homes, which have been designated "Lee Hill" Cottages, have cost about £4,000, and the present accommodation is for 60 boys and girls. The scheme is for six cottages, four having been erected. The accommodation on the ground floor is sitting-room for the children, kitchen with scullery and larder, lavatory and bath, and stores. The contractor for the works was Mr. James Robson, of Waterhouses; the clerk of works, Mr. Thomas March, of Lanchester; and the whole carried out from the designs and under the supervision of the architects, Messrs. Newcombe and Newcombe, F. and A.R.I.B.A., 89, Pilgrim-street, Newcastle. Lanchester cottage homes from the east, c.1910. Lanchester cottage homes (Lee Hill Cottages) from the north, 2001. The cottage homes have now been refurbished for residential use. Durham County Record Office, County Hall, Durham DH1 5UL. Few local records survive. Holdings include some creed registers, and registers of births and deaths.